Hi, we're Jonathan and Kavitha Frank. We remember when we were children, feeling uncertainty about beginning martial arts. We wondered if we had what it took to succeed and we weren't the most athletic or confident child - quite the opposite. Little did we know that beginning our martial arts journey would be one of the most profound experiences of our lives! 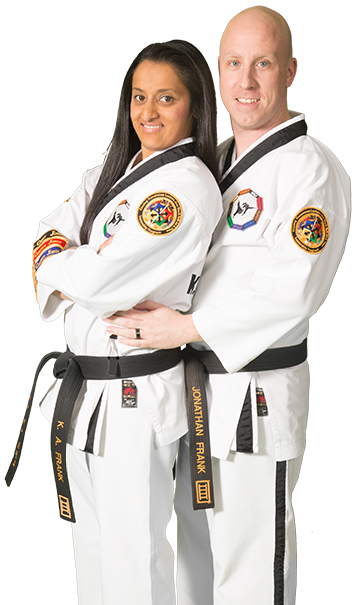 When we opened our school in 2001, we made a commitment to serving and empowering the community of Forest Hill and Edgewood by teaching children and adults the confidence, leadership, and fitness skills that can only be achieved through martial arts. We started our 3 kids and ourselves about 3 months ago, each for their own distinct reason. I have watched my kids grow in confidence and self control in that short amount of time, and know that it will continue. The Franks and their staff are wonderful instructors and people, reaching everyone in their own space. We have grown into this community, and I foresee us remaining part of it for years to come. The kids are participating in their first tournament today, of their own insistence. For one, her confidence was shaky at best when she started at ATA. Today she is excited, and prepared. The ATA team should be proud of their ability to reach and guide their students. My daughter expressed interest in Martial Arts. I signed up for the 6 week trial and by the 2nd week I was hooked and so was my daughter. My daughter wants structure and responds to the reward of earning stripes for her hard work and dedication to becoming black belt leader. Mr. And Mrs. Frank made me feel so comfortable about the program and were able to tell me step by step about the program and what I would be able to expect at each level. Ms. Peterson is absolutely amazing with the children and is able to work with all of them in a 30 minute class. No child is ever left out and they all look forward to every class and they all feel the highest level of confidence and accomplishment at the end of those 30 minutes. ATA is truly a unique family and we are honored to be members!!!!! We signed Connor up looking for ways to help him focus and to give him something special to him. He is thriving. We have seen such a change already in the few months he's been here. He's more confident and focused, and his coordination has improved tremendously. We sincerely love this place, for their wonderfully fun and friendly atmosphere, and for the great teachers and interns. They are respectful to him, regardless of his age, and that's pretty wonderful to a 6 year old...and his parents! Thank you! I can't say enough positive things about this school and how impressed I have been. This is a school that really focuses on the whole child and their personal growth. I feel that the lessons learned at the school are matching how my husband and I are trying to raise our children. Hard work, integrity, honesty, effort and a whole lot of fun will get you where you want to go in life. My daughter expressed an interest in starting martial arts. After doing some research, we decided to try the trial offered here. It was one of the best decisions we've ever made. Ms. Peterson and staff are phenomenal. They're attentive, skilled, and bring just the right amount of serious and fun to the classes so that the kids learn the instruction and never want to quit! In addition Ms. Peterson just gets kids. She's brought about a wonderful change in our daughter's self confidence. We're very happy, and can't imagine going anywhere else. Thank you all for all you do! My son loves going to ATA, and looks forward to it every class. We have been attending ATA since March and we have seen a huge difference in his independence and confidence, as well as respect and participation. He's working hard toward earning his stripes and his belts. Working with the team at ATA has been very easy. Ms. Peterson is able to work with each and every student, and makes each class enjoyable for both the students and parents. I am so happy that we have found ATA and will continue to recommend it! Our daughter joined ATA in Edgewood, MD a few months ago and it has quickly become the highlight of her week! In just a few short months she has released her nervousness of trying something new ( she had never done martial arts prior) and made a bunch of new friends including two that she calls her best friends! Mrs. Frank and her instructors are absolutely engaging with everyone, kids, and parents, and knows each and everyone by name. It’s a great exercise/ energy burner, discipline creator, builder of pride, joy, excitement, and respect. The tiger system truly promotes an eagerness to gain skills and achieve the next success which I can clearly see how it will translate to her future as she grows up. Thanks, ATA.. truly an amazing organization!! My son is a GREAT kid! But needed some help with focus and attention. We wanted our child to receive individual attention based on his needs as a young man and to help him grow into a fine young adult. A young man with a concept of right and wrong, someplace he can grow and develop with discipline and compassion. We found all of that and then some with ATA in Forest Hill. Our son is growing into a fine young man with manners! He says yes Ma'am, Sir. He has respect for his elders and most of all he has FUN, gets exercise and is learning discipline! No two children are the same. At ATA my son gets group growth and individual development. They get to know your family unit and help your child develop into the best they can be. I can NOT put into words how wonderful Ms. Peterson is! And the love she has for her kids is truly evident in the attention she gives each and every student. Signing our son up has been the best decision we have ever made! !